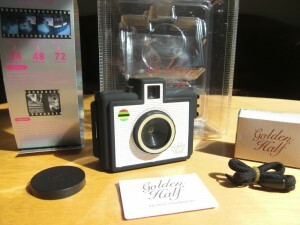 The GOLDEN HALF is a 35mm half-format plastic camera. I discovered it recently while browsing through some alternative camera sites, and since it takes odd 18x24mm pictures (that’s two in the space of a “normal” 24x36mm negative), I decided I had to have it. After 4 weeks and several rolls of film, here’s my two cents. I discovered this camera at the London Photographer’s Gallery, experts and stockists for plenty of Holga & Co schnick-schnack. At £35 not bad for Central London prices (hey, it even comes with a film in the box). Luckily though, the manual is in English and even funny at times. In a nutshell it explains the features of the camera and it all comes in a shiny plastic box, stating that you can take twice the amount of ordinary 35mm pictures (48 on a 24 roll, 72 on a 36 roll – you get the picture). It achieves this by taking a fairly small picture on a piece of film, comparable to that of 35mm motion picture cameras. This idea isn’t new, and in fact goes way back. Had it not been for the ultimate source of all knowledge Paul Weston, I’d never have known. Apparently, Olympus made an entire SLR system around half format called the Pen F series. Very small cameras for the time (we’re talking the late 60ies here), and a whole arsenal of lenses was available. Paul even owned such a camera and says it took cracking pictures – until someone stole it from him in a changing room in Australia. The main oddity of half-frame or half-format is that while holding the camera landscape, you’re actually taking a portrait picture, and vice versa. It’s like using the 645 gate with a Holga. It’s odd, but you get used to it quickly. The other side effect of half-format of course is the image quality. Paul remembers that for 6×4″ prints you don’t see a difference, but of course if you go bigger than that, grain starts becoming very visible. That’s not necessarily a bad thing; I for one am immediately thinking of funky black and white effects and overdeveloped HP5 film for an extra scoop of spookiness (see examples). The camera comes in a choice of black or blue. 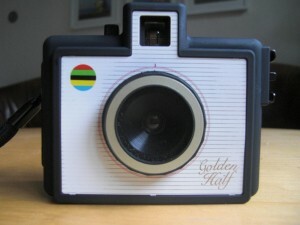 Mine is black with a rubberised finish – like some versions of the Lomography Sumpersampler. 1x tiny Manual, about the size of a 35mm film box. Cute! There’s an inscription on the back, explaining the basic concept. It finishes with “So throw away your book and why don’t you go out”. I love it already! The Golden Half features a very wide lens, 22mm as the manual states. That’s probably the actual focal length of the lens, which means at a smaller frame size, this would appear even wider. A quick glance through the viewfinder confirms this – without fisheye distortion, you can capture A LOT at a time, making this an ideal tool of candid street photography. Cartier-Bresson would have loved it. Be careful though that you don’t go up too close, minimum focusing distance is 1.5 meters (60 inches) according to the manual. In reality, I’ve not had anything out of focus though. I also miss having that feature, even though in reality I hardly ever use it. Same with a blub / long exposure feature – I’d love to see that on the Golden Half. As a contingency, have a look into the Lomography Mini Diana. It’s a bit bigger than the Golden Half but has plenty of other features which I’e grown to love. You can even select the format you take pictures in (sqaure of half). It has multiple exposures too – maybe that’s one to look into. i cant image the result of the photo. can u give an example of the photo? let me describe what I mean. Usually a camera is like a rectangular box, isn’t it? A bit like a pocket book or a paperback. Usually you hold it with both hands, landscape to take a landscape picture, and portrait to take a portrait picture. Maybe this will help to visiualize. Take a sheet of paper size A4 and lay if in front of you (landscape), imagining it is a regular negative in landscape format in a normal camera. Now fold this paper in half (from left to right) making it A5 size like a halfframe negative. By doing this (cutting A4 in half) you remain with a portrait stile negative that is half of the regular size. So, if you still want to make a landscape image with this halfframe negative in your camera, you’ll have to tilt the negative (= the camera) first to align the negative as a landscape negative again. nice artical…maybe you can answer a quick question? how do you make sure that the two pics you are taking come out on the same neg?…if i wind and shoot a couple of frames to bring the film around the take-up spool do i have to count frame by frame to make sure that my pics are in order? by the way..the booklet that came with the unit was in japanese so i am so we say “shooting from the hip” and sort of blind. When you take a picture with the Golden Half and wind the film forward, it will always be half a frame – the film counter counts these half frames (which for the Golden Half are “full” frames – but when you develop the roll and have it printed at a Mini Lab will come out as doubles, i.e. two per picture). Now lining these up is just as easy as snapping away. What *may* happen however is that pictures 1+2, 3+4 etc, get printed together if your Mini Lab starts at the very first frame – or if they don’t you’ll end up with 2+3, 3+4, etc… it’s a little bit unpredictable in that respect. Rest assured though that if printed at a Mini Lab you’ll always end up with two pictures per frame on your prints. If you want more control over this process, I suggest you scan the negatives yourself. THANKS FOR THE QUICK RESPONCE…SEEMS THIS CAMERA IS TRICKY TO SAY THE LEAST, ESP. NOW WHEN I READ OF THE REVERSED VIEWING OF YOUR SUBJECT, IE PORTRAIT IS REALLY LANDSCAPE ETC…..I GUESS I’LL JUST SHOOT AWAY AND PROCESS THE INFO I GET BACK.. Thank you for the nice review. You mentioned you developed color film as black&white. Interesting procedure I would like to try myself. Could you please tell me how to do this?